Ok, so you’ve read up on your paleo basics, you’re excited about the positive steps you’re about to take, and you’re rearing to go. You take a bold step inside your local supermarket, and stop abruptly, looking around with a growing sense of unease at the vast shelves of processed goods, overflowing bins of fresh produce, and quivering piles of meat, fish and poultry. I’ve been there, and I get it. The supermarket for the paleo-conscious is like a minefield, requiring the newly-inducted to step gingerly, lest they put they foot (or in this case, hand) on a food item which appears healthy and wholesome, but is in fact riddled with pesticides and beefed-up on GMOs. Kapow! The bad-food mine goes off in your stomach, you introduce new toxins into your system, and you’re back to square one. 6 years ago, when Liivi and I first jumped on the paleo/primal/Bulletproof bandwagon, we would spend long hours in the supermarket, walking slowly up and down the aisle, examining each potential morsel of food with a metaphorical magnifying glass, and eventually coming to a slow, painstaking decision. We’d get home tired and frustrated, only to find that many of the foods we’d chosen had a sneaky bit of hydrogenated oil or an artificial ingredient that we’d failed to notice in our quest to make it to the checkout with our minds intact. Gradually, we honed the process, to the point where today we can fly through the supermarket, invariably ignoring 90% of the foods on display, and come out the other side with foods that align with our health mandates. And now I’d like to very generously share that information with you, and save you having to go through the same excruciating process that we did back at the beginning. Before we delve into how to pick out the healthiest, cleanest fresh produce, it’s worthwhile revisiting one of the key guiding principles of paleo: keep your sugar levels to a minimum, wherever possible. Now, I’m not talking about removing sugar altogether from your diet: going ketogenic isn’t really my cup of tea. For one thing, sweet things are just so damn delicious, and I’m utterly unwilling to cut them completely out of my life. For another, starving your body of sugar can cause all sorts of hormonal imbalances, the most notable of which is an increase in the production of the stress hormone cortisol, which can in turn contribute to development of auto-immune diseases and annoying conditions like candida. But, because sugar is pro-inflammatory, and can contribute to weight gain and a host of other ailments and diseases when consumed in excess, you definitely need to keep an eye on it. Fruit, as it happens, is high in fructose, a type of sugar that can spike your blood sugar levels and increase your risk of insulin resistance, which in turn can lead to diabetes. For this reason, you should always buy far more vegetables than fruit. Vegetables have all the nutritional benefits of fruit, but without the sugar (with the exception of high-starch vegetables like potatoes), so go nuts in the vegetable department. As for fruit, I find eating between 1 and 3 portions per day is just the ticket – make sure you vary what varieties you eat on a daily and weekly basis, though. In a perfect world, you’d always buy organic produce. Heck, you’d buy organic everything if you could. But, unless you shop solely at an amazing farmer’s market which permits only organic meat and produce (if you know of such a place, I want to hear about it!! ), that’s not really an option. Organic produce is grown and harvested without the use of pesticides, herbicides and synthetic fertilizers, meaning that it is higher in nutrients and doesn’t introduce nasty toxins into your body. But organic produce is expensive, and it’s generally only available for limited varieties in your supermarket (if at all). For this reason, you need to prioritize what you buy organic, and what you don’t. Luckily, the Environmental Working Group (EWG) has already done this for us, producing two lists called the Clean Fifteen and the Dirty Dozen which indicate which foods are better to be bought organic, and which foods are low enough in toxins etc that they can be bought non-organic without too many health concerns. The lists are as follows. If you look at the two lists, you can see a bit of a theme emerging – produce with a thick outer skin that you don’t traditionally eat, like grapefruit, onions, and avocados, is less prone to chemical treatment. Produce which is eaten whole, without anything being removed (like strawberries and apples), is more likely to be sprayed in order to keep its surface blemish-free. The same applies to leafy greens. NOT NECESSARY to buy organic: fruit and vegetables with thick, inedible skins, or skins which you remove anyway before cooking or eating. Things which grow underground, like potatoes and sweet potatoes, are generally ok to eat non-organic, but it’s often better to peel them before cooking to remove potential fungicides. It sounds as weird to me as it does to you, but there it is. Despite that rather confusing revelation, USDA organic remains one of the best ways to buy GMO-free (or mostly GMO-free) produce. 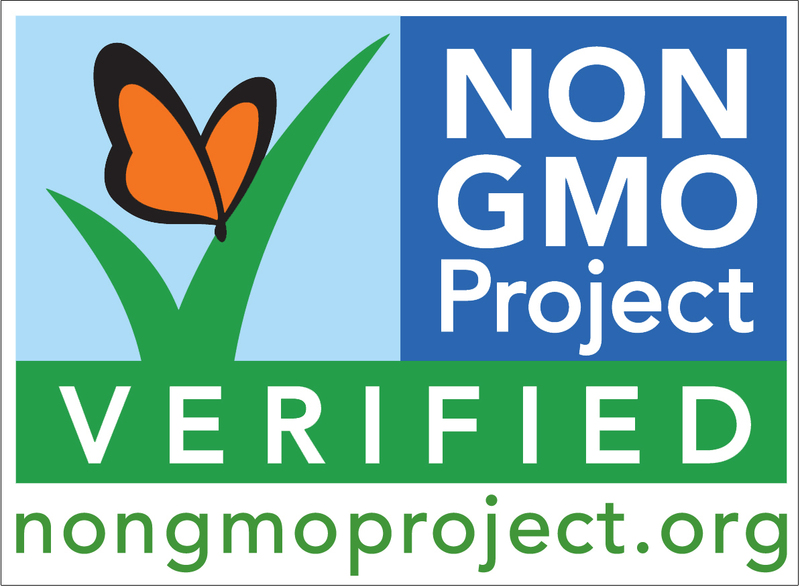 Luckily, however, we’re starting to see many products and produce with the “NON GMO Project VERIFIED” label, which tells you that your fruit or veggies are completely free of genetically modified organisms. We all have different tastes, and I don’t want to be the one to dictate what you should and shouldn’t buy, but not all fruits and vegetables are created equal. Here’s a list of “paleo-approved” produce, adjusted slightly to allow some primal diet goodness into the mix. Things like avocados, peppers, tomatoes, cucumbers, squash and pumpkin are technically fruit, but I’ve included them here as most people think of them as vegetables. The bottom two rows are red because these vegetables are high in starches, which means that you need to moderate the amount you eat of these each day. As a rough guide, limit your consumption of starchy vegetables to a handful per day. Within the “approved” fruit category, there are those varieties which are better than others, and these largely consist of berries. Because they have a preposterously high nutrient content and relatively low sugar content, they should always go to the top of your fruit shopping list. I have a love affair with raspberries and have often been heard to proclaim that they are the “king of fruit”. Turns out I was right! Well, more like the oligarch of fruit, but I’ll call that a win! That’s about it! The above should provide a solid basis for you to become a produce-shopping superstar, saving you some serious time and preventing some major paleo setbacks. If you’re really serious about taking your diet to the next level, our ebook The Paleo Guide to Beating Candida Naturally has a comprehensive, detailed section on what you should and shouldn’t eat, and even more on shopping for the right stuff. Even if you don’t have Candida (chances are, you probably do), it’s an invaluable guide. Ancestral Nutrition, Food as Medicine, Natural Self Care bulletproof, buy, fruit, grocery, how to, list, paleo, primal, shopping, vegetables, what to. permalink.